Technologists play a crucial role in preparing patients for MRI exams. As lead research MRI technologist at Phoenix Children's Hospital in Phoenix, Amber Pokorney, RT(MR), knows that she and the nine full-time technologists she works with must be more than just good MRI image creators. To do their jobs effectively during the approximately 40 scans they perform seven days a week, they must also serve as educators, anxiety reducers, and sympathetic ears for patients and their worried parents who come in to determine the source of their medical problems. Pokorney, who has 16 years of experience as an MRI technologist, including seven with pediatric patients, has learned that the biggest challenge to getting quality MRI images with both adults and children is eliminating the movement that can occur when patients are anxious and do not know what to expect. Patient movement leads to blurry images—think trying to take a photograph from a moving car—that need to be retaken, thus creating more anxiety for both the patient and the technologist. Adding to the challenge is the need to describe MRI imaging in an age-appropriate way, since pediatric patients run the gamut from neonatal ICU newborns to young teens to older, adult-sized teenagers. In addition, because having an MRI for the first time is an unusual and possibly off-putting experience marked by loud, fluctuating noises and as much as 30 minutes spent motionless in a confined space, Pokorney says it is not only important that patients are aware of what to expect but also that technologists know what it is like to undergo the MRI experience themselves. She has made it a point to spend time laying in the bore of one of the hospital's two Philips Ingenia 3.0 T scanners and its Philips 1.5 T Achieva scanner. There are always opportunities for new technologists who join the team to do the same, she says. "Since I am in research, we have to do a lot of trial scans," Pokorney says. "So I'll ask [new technologists] to volunteer and let them experience what it feels like to be in the scanner and how close it is, so when they actually have to interact with patients they can say they have been in the scanner." Technologists who have been scanned can more fully describe the experience and have a better idea of how to position patients so they are as comfortable as possible. Comfort is key, both mentally and physically, she says. "If you don't know as a technologist how it feels to lay in the scanner, you don't know everything else that goes into it. You don't know whether your head is going to start hurting or, if your arm is positioned a certain way, how long you can have it like that until the blood cuts off and you start tingling and feeling pain." For children who are old enough to understand, particularly 8- to 13-year-olds, Pokorney will describe the MRI's noises as similar to those found at a loud construction site or inside an automobile when its antitheft alarm goes off. She encourages young patients to turn those discordant sounds into music, perhaps by imagining themselves banging on a trash can or crashing two pieces of metal together. "I try to get them into an imaginary world when they are laying there so they can forget why they are in there and actually think about something that makes them happy—anything other than the scan itself—and usually they do pretty well," she says. In addition to telling young patients to "be like a statue from your nose to your toes," Pokorney recommends educating parents so they can serve as the technologist's collaborators. If there is time, the technologists at Phoenix Children's Hospital let the parent and child see a video they created that shows what to expect during an MRI. Next, there is a discussion that allows parents to have their questions answered. If the parents are cooperative, Pokorney encourages them to answer their child's questions; this has the added bonus of delivering the information via a trusted source. Older children also pay attention when she tells them that they will be done more quickly if they stay still and that, no, their braces will not be sucked out of their mouths during the scan. Allowing parents to accompany their child in the scanning room also may eliminate anxious moments. Parents are allowed in if the child is not under anesthesia, Pokorney explains. Once in the room, if they are within reaching distance, parents are free to hold their child's hand or touch their child's foot during the scan as a way to reassure them. Of course, even with calm, well-behaved patients, MRI technologists may bring their own anxieties to the screening room, Pokorney says, especially since the software they use is constantly being updated. Technologists need to stay abreast of the changes so that they can perform their jobs quickly and flawlessly and minimize their own anxious moments that could spill over to patients. Because technology changes so fast, it can be difficult to stay up to date on changes in MRI technology, even with the required continuing education credits. For that reason, Pokorney recommends designating one technologist to serve as a superuser—a technologist-educator tasked with sharing important updates with coworkers. 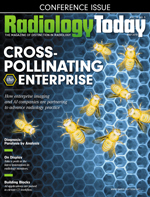 Pokorney predicts that procedures enabling quicker MRI scans will be developed, eliminating the need for patients to stay still for long periods of time, lessening the need for anesthesia, and leading to greater efficiencies for technologists. As a researcher, she and her team are studying different scanning techniques that will allow high-resolution imaging to be performed in less time. Pokorney predicts that time savings will be routine within five to eight years, and streamlined processes will allow more time for technologists to focus on patient comfort and satisfaction. "I think that is going to be a huge thing," she says. In the meantime, Pokorney says taking the time to relate to each patient pays huge dividends. "I always try to relate to the patient and not be that scary medical person who comes to grab them and puts them in a machine without saying anything. The moment you have them engaged is the moment trust is developed, and they will almost do anything for you." — Gail Snyder is a freelance writer based in Chalfont, Pennsylvania.